Heat the oil in a 12-inch skillet over medium heat. Add the onion, celery, carrots and black pepper and cook until the vegetables are tender. Stir the mushrooms, tomatoes, garlic and thyme in the skillet and cook for 5 minutes. Stir the broth in the skillet and heat to a boil. Reduce the heat to low and cook for 35 minutes or until the mixture is thickened. Heat the water in a 4-quart saucepan over medium-high heat to a boil. Stir in the polenta. Cook and stir for 5 minutes or until the mixture is very thick. Remove the saucepan from the heat. Stir in 1/4 cup cheese. 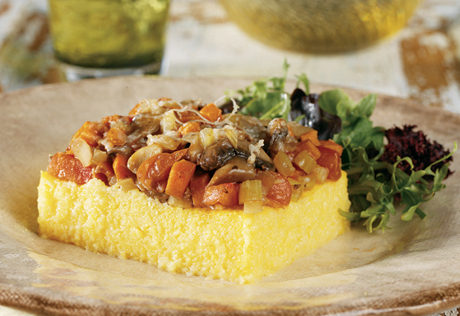 Spread the polenta in a 3-quart shallow baking dish. Let cool for 10 minutes. Spread the vegetable mixture over the polenta. Sprinkle with the remaining cheese. Bake for 30 minutes or until the vegetable mixture is hot and the cheese is melted. *Use shiitake, cremini or oyster mushrooms. Tip: To make ahead: This dish can be prepared and completely assembled a day ahead. Cover and refrigerate overnight. Bake at 350°F. for 35 minutes or until the mixture is hot.